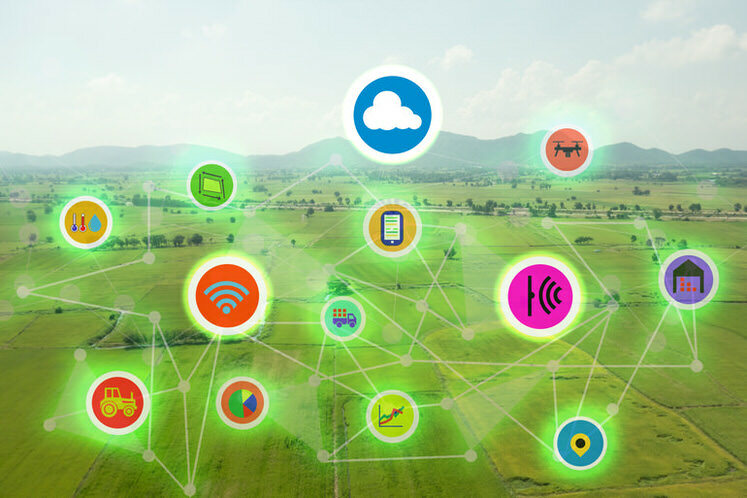 Australia’s Commonwealth Scientific and Industrial Research Organization (CSIRO) has to lead the Australian Center for Broadband Innovation (ACBI) research initiative to create greater awareness and understanding of the potential for smart farming, which is enabled by internet services. Part of the initiative has been the test of IoT services on Kirby Smart Farm at Armidale in New South Wales. The initiative worked in conjunction with Australia’s University of New England to set up the 2,800-hectare farm with more than 100 soil sensors and placed tracking systems on its cattle. The data from the systems connects through a gateway to cloud services for analysis. The soil sensors are distributed throughout the farm in locations that represent a region of consistent soil conditions and form a mesh network that reports soil moisture, temperature, and conductivity, as well as temperature. The cattle tracking system uses low-power ear tags to provide individual locations for cattle within a 7km with an accuracy of 15m. CSRIO is also testing its own sensors based on accelerometers and GPS for fine-scale cattle tracking. These two examples of IoT technology provide useful information to the farmer. For instance, the soil sensors, help farmers determine the optimum time to plant in a given area as well as when to irrigate. Tests elsewhere in Australia have shown that selective irrigation, which is based on local soil needs, instead of watering large areas or on a schedule, has nearly doubled the yield per megalitre of water used. This technology can also provide farmers with information on the best time to plant, when to fertilize and when to move livestock from one pasture to another. The sensors on cattle allow farmers to keep tabs on animals across large grazing areas. The system can be set to generate SMS alerts whenever an animal wanders or is taken, out of the designated area. This gives farmers’ help with livestock management as well as providing immediate notification of theft. Collected data can also be combined to calculate a comprehensive climate index that helps gauge the stresses that the environment places on an animal. Using the indicators to evaluate an animal’s well-being allows the system to generate alerts when an individual animal is at risk in its current environment. Other cross-network analysis can provide insights into such things as soil fertility, pasture yield, feed prediction, and weed management. The purpose these pilot programs hope to achieve is to help farmers increase food production to meet an anticipated 50 percent increase in demand by 2030. They hope to achieve this by providing farmers with detailed insight into daily conditions and advice on actions to take in response. IoT technology is helping meet that projected increase.